Here are a couple of new concepts we created for Qs/1. The images will be used for ads about their cloud-based services and rock-solid server stability. Note that the entire rock formation was created via CGI, which had to be molded and modified along the way to satisfy the tastes and final ad layout needs of the art director. Read This Book By The Cover! We continue to work with our friend Vani Hari, aka The Food Babe, on her various photo and video needs. 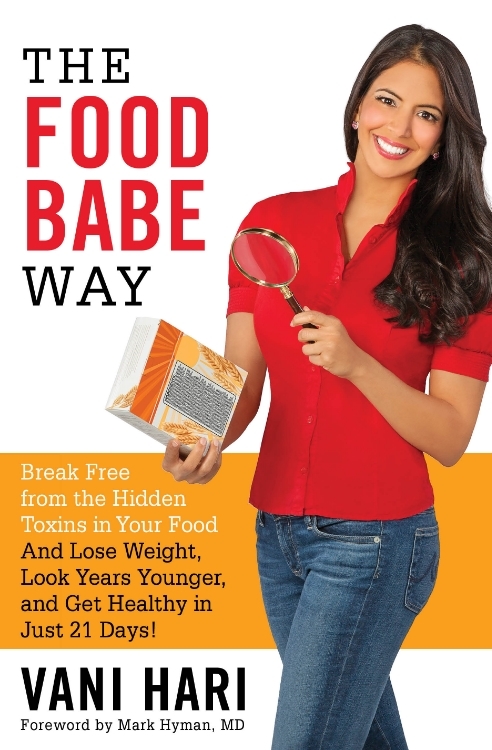 We're so happy that her book, The Food Babe Way, is now a NY Times Bestseller! Our photo graces the cover of this book, and we're so pleased to be a part of her mission to better our world's food supply. I Froze My A$* Off For This Shot! National Gypsum came to us with the concept of showing how buildings come to life - starting from the initial concept sketch, through the construction process, and then showcasing the finished structure. We used a combination of 3D imagery, illustration and photo compositing to produce the visuals below. These will be printed in a new book about National Gypsum's product lineup. Can You Imagine Arts, Science and History in 2025? We Did! New Portfolio Work for Corbis! Dramatically altering the look and feel of an image for our clients is pretty commonplace at this point, so sometimes I forget just how much people are wowed by what we can do. Here is a before/after of a shot I took for Foundation for the Carolinas. It's a teaser image for the upcoming unveiling of a new glass deck they are opening on the 4th floor of their uptown Charlotte building. Needless to say, the client was very happy! Gallery Twenty-Two Showcases "GMO Corn"
We created a fine art project about GMOs for a gallery show at Gallery Twenty-Two, who is hosting a Charlotte photography show during the month of November. Our image shows a Monsanto-like company pumping chemicals into the roots of the man-made corn growing on the surface level. The many background elements are all showcasing various products that are created using corn. For instance, oil drilling requires a corn-byproduct that keeps the drilling fluids from spilling back to the surface. GMO corn feeds many people throughout the world because we grow so much of it, which is why we featured a helicopter air dropping food onto a village. There is an ethanol gas station, cows eating GMO feed, and people lining up to get their fill of high-fructose corn syrup. The photo also features FoodBabe, a mega-blogger who investigates our food supply and is very against GMOs in our food system. Learn more about her pursuits at foodbabe.com. The final image, as usual, is a combination of photography and cgi. The corn cob, the lab, the landscape, the village and various smaller elements (such as the wooden stand and feeding troughs) are all created via 3D artistry and CGI. The sky, people, ambulance, gas station, and corn are all photos. We tried not to make a judgement call on whether we as a society should be using GMOs. On one level, they can be supremely beneficial. For instance, scientists are working to change the genetic makeup of sweet potatoes so they can grow in the desert. Can you imagine if suddenly a new food crop could spring up in Africa and wipe out that continent's food supply problem? Of course, the downfall is how untested these foods are. Several of our friends are doctors, including one who is a doctor/Chinese medicine practitioner specializing in autoimmune diseases, who claim that genetically modified wheat is causing a huge host of problems in the patients they treat. Sean is currently reading a book called Life at the Speed of Light by Craig Venter, a synthetic biologist who led the Human Genome Project, and it's obvious from the book that science is quickly heading towards the creation of life forms to serve us. It's a fun and exciting topic to discuss, which is why we used our CGI photography skills to create this fine art image. We hope you enjoy! This guy, an executive with a pharmacy chain in Georgia, was shot in Acworth, GA and merged with this CGI word in post-production. We shot this pharmacist in Long Beach, WA. I was a bit under the weather for this trip and so can be sure in my advice that taking redeye flights while sick is a bad idea. All is well that ends well, however. We photographed this pharmacist in Long Beach, CA for QS/1, maker of a software that runs pharmacies across the nation. Created via CGI, this image will join the QS/1 ad campaign in trade magazines and direct mail. We worked with Beards BeCAUSE, a Charlotte anti-domestic violence group headed by our friend Jared Yerg, to bring attention to peoples' misperception as to who commits these terrible acts. Get it? We don't often showcase our retouching, especially for a rather simple project such as this. But we really want to give a special shout out to our friend Vani Hari at Food Babe (foodbabe.com). She's doing amazing things with investigating what's going into our food supply and has a massive online following. Check out her great site and learn how we can all make the world (and especially our bodies) a better place. We've just completed this new campaign for the City of Charlotte. We are excited to see this project get launched, but unfortunately, it has a rather sad backstory. Recently a boy was struck and killed by a car when he swerved into the street to avoid garbage bins that were left in the middle of the sidewalk. This campaign was created as a public service announcement to keep the sidewalks clear. Hopefully we're saving lives with our work because we certainly don't want to ever hear of that happening again. Look for these images to be popping up around Charlotte the next few months. As usual, this project was enhanced by CGI. That's because we wanted our background to show a nice summer day, but we were creating this project in January. So, CGI to the rescue! Here is the untextured CGI scene that Peter (our fearless Imaging Director) created for this campaign.